Bag: Ross (Similar here), Sunglasses: A beach in Mexico. I'm pretty freaking stoked to be teaming up with Veryjane this month. Basically it's the best business idea anyone ever came up with. You know how online stores and boutiques always carry the cutest stuff but sometimes they're just so dang expensive? That's where Veryjane comes in. They find those adorable boutiques and get you crazy good deals on the products- sometimes as much as 75% off! I know it sounds too good to be true, but I speak the truth, people, I speak the truth! Right now they're selling a J.Crew inspired necklace for 53% off. They've sold 438 in two days- no big deal. The deals change every day, and sometimes the goodies are snapped right up before you even have a chance to get your hands on them. That's why you have to check back often- you know, like you do on twitter or pinterest! Take a look at the site and you'll seriously be amazed. I'm a gal that loves a bargain, and this is as great an online bargain as I've ever seen. Oh- and the variety is out of control- from jewelry to iPhone cases to chevron pillows to baby onesies- you can find anything you want from Veryjane. The best news of all is that they are giving one two THREE of you a $25 voucher so you can get yourself some screaming deals for free. What's not to love about that? All you gotta do is follow on facebook, friends. Easy freaking peasy. Pretty outfit!!! Your fashion posts are getting better and better!!! I love the digital print tank top!! Hmm...Bliss Bracelet, Lace Top, Pillow Covers....etc.! Happy Summer, Teach! I love the designer inspired circle necklaces! There are so many things I would love to have! If I won I would get the Summer Road Trip Car Organizer. Super Cute!! I love that look you put together! 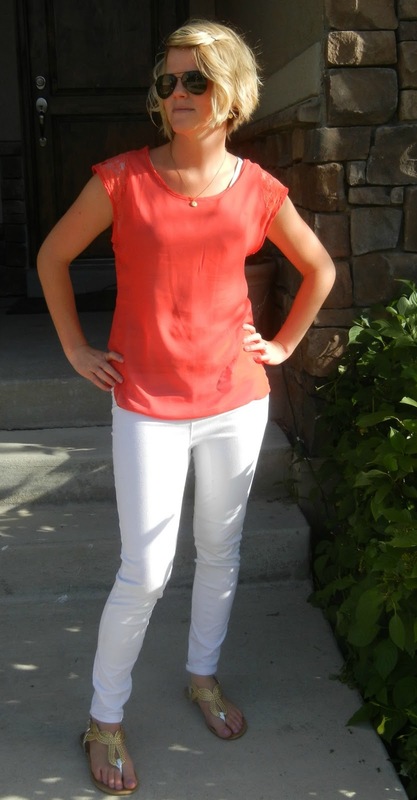 White jeans are my fav for spring & summer! So pretty! Love the color combo too!